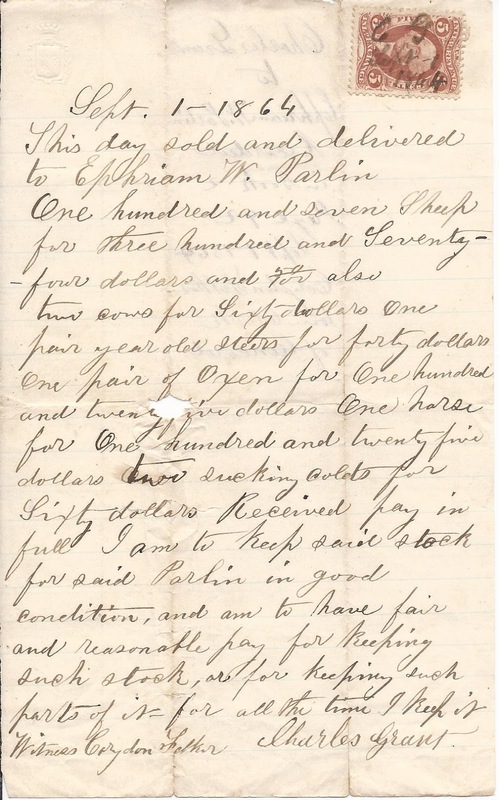 1864 handwritten document from Charles Grant of Concord, Maine, referring to the sale of livestock to Ephraim W. Parlin. 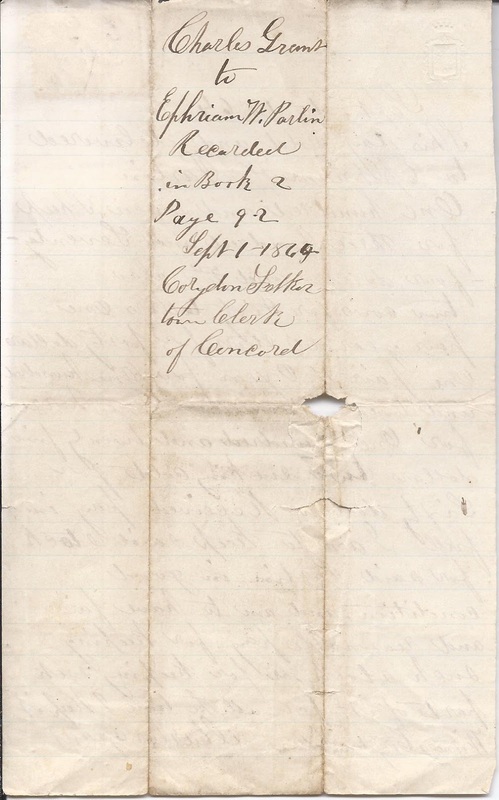 The note was witnessed by Corydon Felker, Town Clerk of Concord, Maine. 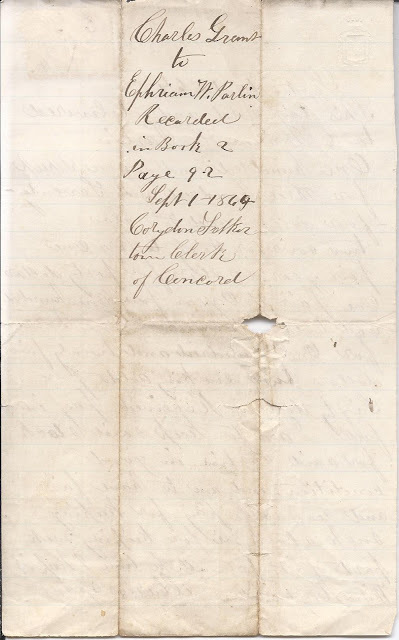 Charles Grant was born 26 August 1810 at Concord, Maine, the son of Jonathan and Martha (Lowell) Grant, about whom I could find nothing further, except that they had a farm at Concord, which Charles continued managing. On 6 July 1835 at Moscow, Maine, Charles married Elizabeth Greenwood, daughter of Gilbert and Elizabeth (Russell) Greenwood. She was born 13 April 1815 at Moscow. Her paternal grandparents were Miles and Elizabeth (Rhodes or variant) Greenwood. Her maternal grandparents were Calvin and Hannah (Bailey) Russell. Charles and Elizabeth raised a family of nine at the farm and moved to Solon, Maine, in their later years. Several members of their family were involved with Shiloh, also known as "The Kingdom", founded by Frank Weston Sandford at Durham, Maine. Ephraim Wood Parlin was born 7 November 1813 at Bingham, Maine, the son of Stephen and Elizabeth (Fletcher) Parlin, Norridgewock, Maine, natives. His paternal grandparents were Silas and Lydia (Wood) Parlin. His maternal grandparents were Amos and Elizabeth (Baker) Fletcher. On 14 October 1835 Ephraim married Eveline Leadbetter, daughter of Thomas and Eunice (Clark) Leadbetter, who were born at Vinahaven or Camden, Maine, and Livermore, Maine, respectively. Eveline was born 14 October 1815 at Leeds, Maine. Ephraim and Eveline raised a family of five daughters at their farm at Pleasant Ridge Plantation, Maine. All of the daughters married, but two died in their twenties and another in her thirties. Concord Town Clerk Corydon Felker, who witnessed the document, was born 20 January 1832 at Concord, Maine, son of Daniel and Katherine (Crosby) Felker. His paternal grandparents were Michael and Mary (Floper) Felker. His maternal grandparents were Jonathan and Katherine (Houghton) Crosby. Corydon Felker married Emma E. Dexter of Lexington Township. They settled at Concord and later Solon, Maine. They had at least one child, Katie, born about 1872. Corydon's name appears in an 1879 Somerset County Teachers Convention program, which I featured in an earlier post. This day sold and delivered to Ephraim W. Parlin one hundred and seven sheep for three hundred and seventy-four dollars and 50 cents. Also two cows for Sixty dollars. One pair year old steers for forty dollars. One pair of Oxen for One hundred and twenty five dollars. One horse for One Hundred and twenty-five dollars. Two sucking colts for sixty dollars. Received pay in full. I am to keep said stock for said Parlin in good condition, and am to have fair and reasonable pay for keeping such stock, or for keeping such parts of it, for all the time I keep it.